Some people may not know but one of the driving aims behind The Old Print Works is to encourage hand skills: designing and making quality things for everyday use. We host a number of makers in the building and are always looking to attract more. You may ask why this is necessary. We are going through a fourth industrial revolution where the power of digital, artificial intelligence and robots will lead to the replacing of many existing jobs. Many of the skilled jobs have already gone but more are sure to follow. Do we still need these skills? Recently, an eminent surgeon, Professor Kneebone, complained that current students brought up on a diet of screen-based entertainment do not have the dexterity needed to sew up wounds, or the understanding of materials to know how much they can pull on an intestine or vein before it breaks. The professor, who teaches surgery to medical students, says young people need a more rounded education, including creative and artistic subjects, where they learn to use their hands. The lack of practical hands-on skills as kids grow up is limiting and even though technology will increasingly take over the mundane and the repetitive tasks, there will still be need and scope for the bespoke and the beautiful hand crafted pieces of work. The box shown, made by one of our carpenters, is a case in point. He has power tools to help him but the corners/tenons on this still needed the precise hand-eye coordination of a skilled carpenter. Speaking of starting young, one of our unit partners, Richard Newton, a Montessori trained teacher of over 30 years, takes children of primary school age and younger in his CDT-X sessions and gets them making a myriad of wooden objects. It is amazing what they can make at such tender ages. The focus on hand skills also supports one of our other aims - the aim to promote a less wasteful, more sustainable life. As we move to a society that recycles more and values secondhand items the need for hand skills and an understanding of the practical and the physical in bringing items back into use will become more important. No longer should we throw away items that have stopped working. 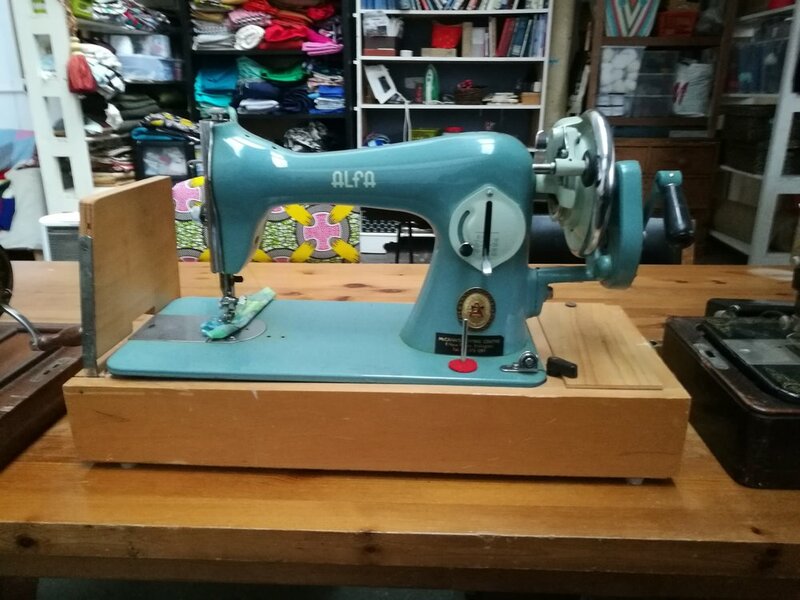 One of our volunteers lovingly restored this classic 1960’s hand-cranked sewing machine which is now back in full working order. We are also lucky enough to host the rapidly-growing Sundragon Pottery who cater for both beginners and expert potters in a friendly supportive environment. There are very affordable options. So whilst digital is great and opens up a host of opportunities for young and old alike there are many reasons to not give up on hand skills. Digital can play its part in spreading hand skills knowledge as youtube videos on how to repair items are a real boon. If you are a designer-maker (jeweller, ceramicist, carpenter or whatever) and you want a space to work, please bear us in mind. If you are interested in sharing or learning skills and want to put time into developing something, do get in touch. We want to hear from you.